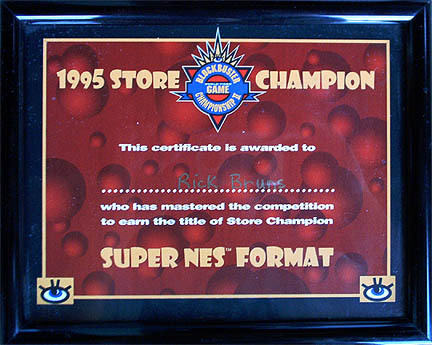 This Super Nintendo cartridge was used in the Blockbuster World Video Game Championship II. That took place in the summer of 1995. "Resale/Rental of the Game Pak is Prohibited!" is written along the top edge of this cartridge. Now it's your turn. The clock's ticking down as you dash through Donkey Kong Country. Forget the bananas--Just finish as many levels as possible. To make it through eight random levels, you gotta have lots of juice. Think it's easy? Only the few and fleet will ever be able to take up the challenge, because Nintendo minted only 2,500 of this special edition. Copyright 1995 Nintendo Blockbuster World Video Game Championship II name and design are trademarks of Blockbuster Entertainment Inc., Ft. Lauderdale, FL 33301. My high score when playing in the competition was 3826. That was at the Blockbuster in Binghamton, New York at the Vestal Park Way (Raymore & Flanigan Plaza) store. My score was the highest in New York State but it was not the highest in the country so I did not win the trip. 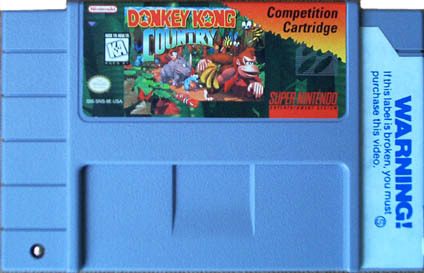 A while after the competition was over Nintendo sold the Donkey Kong Country Competition Cartridge for $35 through the Super Power Supplies Catalog that came with Nintendo Power magazine. Nintendo included a box for the game. No instruction booklet was made for this version of the game.